Reversible Furniture Slipcover Suede and Sherpa, by Sure Fit, is a stylish, sophisticated, and cozy furniture cover featuring a smart reversible design. 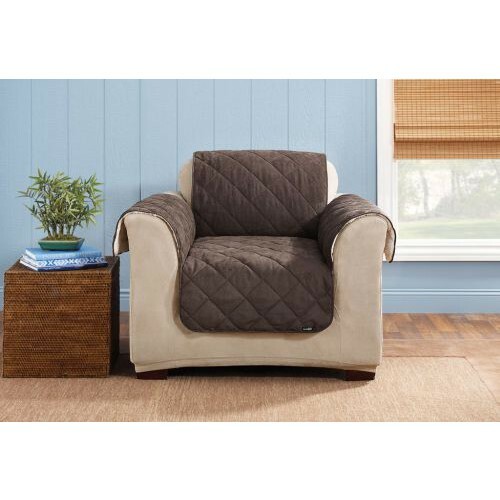 Your pet and family will love the feel and comfort of the soft suede, and if you feel like switching it up, this classic diamond-quilted pet cover reverses to fleecy sherpa with ultra-soft pile, providing two looks for the price of one. 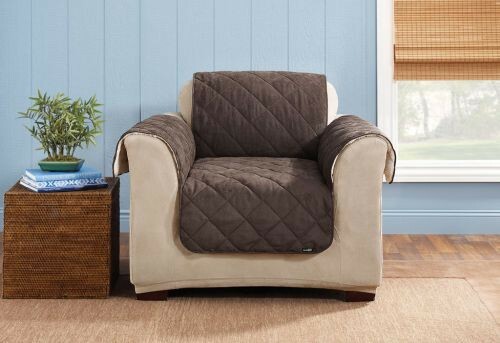 Reversible Furniture Slipcover Suede and Sherpa features a layer of lofty poly fill, as well as a durable, double layer design with an extra-long 50-inch backdrop to prevent slippage. Available in Chocolate, Taupe, plus two beautiful new neutrals, Cocoa and Graphite. 100% polyester with fill and faux sherpa backing. Vitality Medical also carries other pet covers, such as the K and H Pet Products Economy Cargo Cover Mat and the K and H Pet Products Bolstered Furniture Cover. Smartly Reversible Soft Suede to Fleecy Sherpa Provides Two Looks For the Price of One. Extra-Long 50-inch Backdrop to Prevent Slippage. Material: 100% Polyester with Fill and Faux Sherpa Backing.